Last week I happened to make these pancakes with the ingredients I have on hand, as they turn out to be the best pancakes I’ve tasted. My husband said the same too. These pancakes are scrumptiously unique, with a sweet flavour close to cake batter. They are perfect for Christmas morning or a special breakfast, since you can make the almond paste and baking mix ahead of time or buy it ready to go. You could further bedazzle your guests by adding a fruit sauce or colorful fruit garnish if you like. I couldn’t resist making two versions of pancakes. First I made them with real dairy ingredients. Then I converted the recipe to be dairy free. So you can take your pick and enjoy the pancakes either way. I certainly did. Thank you, Quyen, for sharing your recipe! Simmer maple syrup with two cinnamon sticks and/or 1/4 teaspoon ground cinnamon. Transfer to syrup dispenser and pour warm syrup over pancakes. Mix all the ingredients [wet, then dry] except almond paste and butter until smooth. Butter the hot pan/griddle, then spoon about 1/4 cup of the batter for each pancake. Top them with cubes of almond paste. Turn to cook the other side. Check them frequently so the almond paste does not burn. Serve warm with your favourite syrup. I’m apt to share recipes at Allergy Free Wednesdays and here. These look so nice and fluffy and sound so flavorful — I love the addition of yogurt! These looks delicious and so fluffy!! 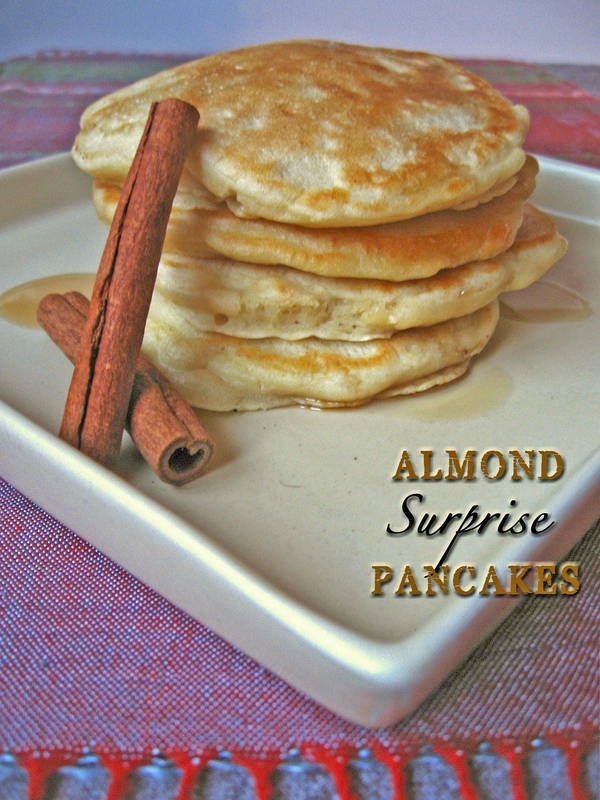 The cinnamon maple syrup sounds like it would be just the thing to top these off! Thank you for linking up to Saturday Dishes. Hope to see you next week. Thanks. 🙂 They are very good. I hope you get to enjoy them soon! I love how light and fluffy these pancakes are! I’m sure my boys would LOVE them! I hope you get to try them! Thanks for taking the time to comment!